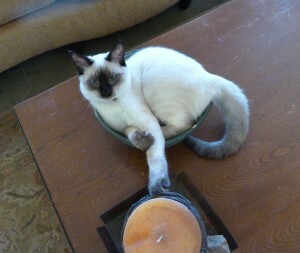 The Siamese Terrorist keeps growing and terrifying all those in his wake. 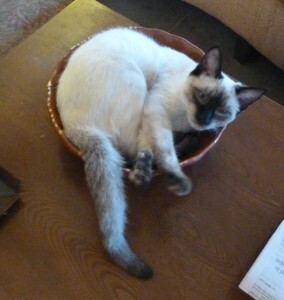 Do you remember that a couple of weeks ago, I was concerned that he was outgrowing his favorite sleeping bowl? So the other day I heard a large crash in the living room. 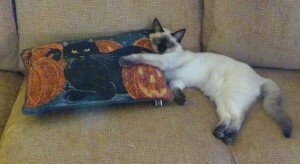 Actually nothing unusual around here as we do live with The Siamese Terrorist. I walked into the room only to see this. Oh no! 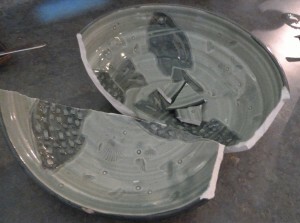 The sleeping bowl broke! Actually I think what happened was that he tried to get out of it, got stuck and somehow it landed on the floor. I was quick to the rescue with the larger bowl. I figured maybe he wouldn’t reject it this time. It’s been working fine, though Sammy (No!) has been becoming a bigger and bigger brat. The other night he escaped through the window screen and I spent half the night trying to chase him down. Did you know it is a lesson in futility to try and catch a wild kitten? Either that or it would make a great aerobic DVD. He just laughed and hung up on me. 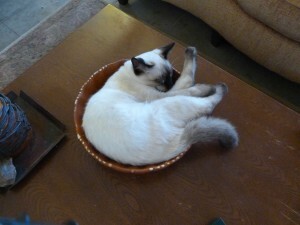 But I noticed yesterday that when Samino does finally sleep, he’s once again outgrowing the new bowl. So I guess I’m going to have to find a bigger bowl around here because sometimes he gets so frustrated he has to sleep elsewhere. And Chuck, well he’s already bored with the whole bowl thing. 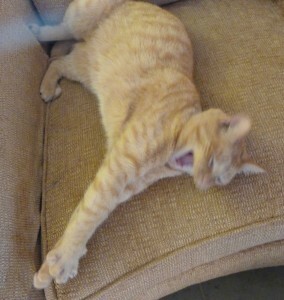 He’s just in mid yawn. Next week I’ll give you the November update on The Funny Farm and maybe we’ll cook up some comfort food.